This Week in My Classes: Middlemarch Everwhere! After all that concentrated activity in February, I found myself quite out of energy at the end of last week. I deliberately took it fairly easy over the weekend, to help myself recharge, and it was nice to putter. I did some reading–my book club is discussing Tender is the Night on Saturday, so I worked on getting into that (I’m not loving it–the self-absorbed and over-emotional characters are having something of the same effect on me as the crew in The Good Soldier–I think I’ll try to steer us in some new direction for our next read), and I had a nice trip to the public library with Maddie where I picked up Helen DeWitt’s Lightning Rods from the ‘new fiction’ display (I’m already nearly finished reading it, as it moves along quite fast, and I have really no idea at this point what to say about it except that if it weren’t by the author of The Last Samurai I never would have tried it). I finished the King Tut jigsaw puzzle we got for Christmas, I played MarioKart and Life with the kids…and I read Books III and IV of Middlemarch and organized lecture notes for today’s classes. Yes, that’s right: reading Middlemarch was preparation for both classes! 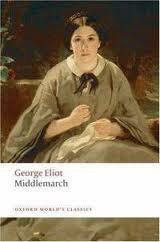 This week and next it’s Middlemarch everywhere! This is partly great, because the more time on Middlemarch the better, and it’s convenient to have my class reading do double duty. It is also partly difficult, because the classes have different purposes, so I can’t just use the exact same materials for both of them even if I wanted to–which I don’t anyway. There has to be some overlap, because after all, it’s the same book, and one little challenge is remembering what I’ve said to which group. But I’ve been thinking that this time around especially, because there are quite a few students who are in both classes, I should really try to address some different issues in the 19th-century fiction class than I do in Close Reading. In Close Reading I’m spending a lot of time on the structure of the novel. In Friday’s tutorial and again today we worked on chronology, looking at episodes in which there is significant backtracking or circling around to return us to the same moment in time from a different point of view. I asked the students to look especially closely at Chapters XIX-XXII and then at Chapters XXVII-XXIX. Not only do these chapters include some of the novel’s greatest passages (the squirrel’s heartbeat passage, for one, and the equivalent centers of self, and the pier glass passage, and then ‘But why always Dorothea?’) but they are beautiful examples of that chronological manipulation. The main point I try to get across is that Eliot is dealing artistically with the problem Carlyle identifies in his essay on history: “narrative is linear but action is solid.” How do you deal with simultaneity, especially if you are committed (for moral as well as artistic reasons) to showing things (objects, people, events, histories) from different points of view? Chapter XXII, which deals mostly with the developing romance between Lydgate and Rosamond, ends with Sir James Chettam’s servant meeting Lydgate and Rosamond on the road (they are out for a walk) and summoning Lydgate to Lowick. The next two chapters take us back in time and bring us up to this same moment as it occurs in Dorothea and Casaubon’s story. To Lydgate and Rosamond, the servant’s arrival is a positive sign of Lydgate’s advancing career (which, for Rosamond, is also welcome confirmation that Lydgate is just the man she imagines him to be and will play just the role she wants in her fantasy). To Dorothea, Casaubon’s attack is key to her developing pity for him, and to redefining her married life in terms that have little to do with fulfilling her own aspirations. To Casaubon, his illness is a painful reminder of his mortality–and thus we end up, later on, with Chapter 42, my favorite in the whole novel. We’re spending a lot of time on technical things in Close Reading–we’ve talked about point of view, narration, theme, plot, characterization, allusion, and figurative language as important parts of the craft of the novel. Of course I want to address some of these same things in 19th-Century Fiction (you can hardly read, much less teach, Middlemarch without addressing point of view, for instance!) but I’ve been thinking that my usual approaches tend to shortchange stories outside the Dorothea-Casaubon-Will and Rosamond-Lydgate axes. Fred and Mary don’t get nearly the attention they deserve, and neither does Bulstrode, or Farebrother. I’d also like to spend time on the novel’s political contexts and Mr Brooke’s run for Parliament, which I probably won’t have time for in Close Reading. There’s never enough time to talk about everything! It would probably be good for me, too, to back off a bit and see what the class wants to talk about. I’ll try. It’s hard, when my own enthusiasm is high and also when the challenge for them of just doing the reading seems pretty great. I scheduled four weeks for the novel in Close Reading, so we aren’t exactly rushing; we have almost but not quite that much time for it in 19th-Century Fiction. All of this planning may be up-ended, mind you, as the Dalhousie Faculty Association is currently in a strike position as of Saturday, and conciliation does not seem to be going well. But as I told my students, whatever happens you’ll be doing some kind of assignment on Middlemarch, and you can’t go wrong during any disruption of regularly-scheduled classes if you just keep reading…and reading.